Can big, long speeches about economics made in the House of Commons on a weekday lunchtime ever pack enough punch to shift the mood of the entire nation? Of course not. Budgets take time to filter through to the public – days and possibly even weeks. And even then, their impact is limited to those who are willing to notice. 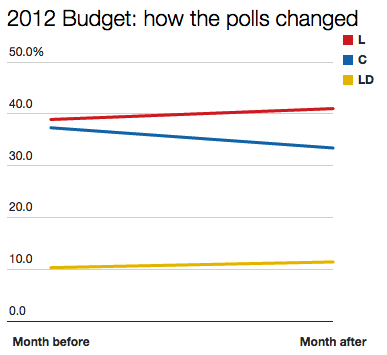 This trend was more to do with a decline by Labour than an increase in support for the Tories, however. 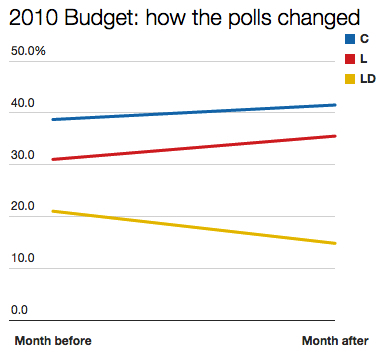 That just leaves 2010: the only occasion in this parliament that a Budget has taken place when the Conservatives were ahead in the polls. This Budget was the first real political event after the general election, and I wonder if it crystallised in a lot of people’s minds their attitude towards the coalition, in particular the role of the Liberal Democrats. 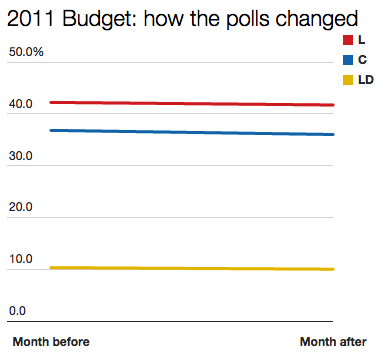 A marked shift in support away from the Lib Dems began around the time of this Budget and continued for several months, the legacy of which the party is still living with today. 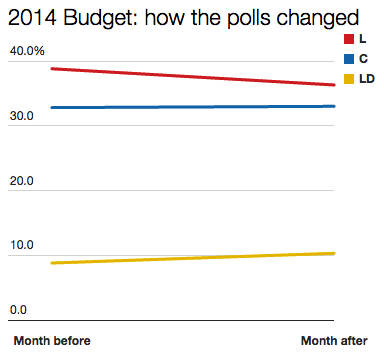 A month before this year’s Budget, Labour had a lead over the Tories averaging 1.5 points. Its current lead is averaging 0.8 points. One month from now we’ll know whether this particular trend has behaved like those of the last couple of years. George Osborne for one will certainly be hoping it does. No doubt much of the Lib Dem decline immediately after the election in 2010 was the loss of former Labour voters, disappointed with the coalition. When did the Lib Dem’s new position on university tuition fees become apparent? I think it was shortly after General Election, Andrew. It will be interseting to see what effect Tuition Fees have in University seats especially the 3 way marginal of Cambridge. I think Julian Huppert will hold it. 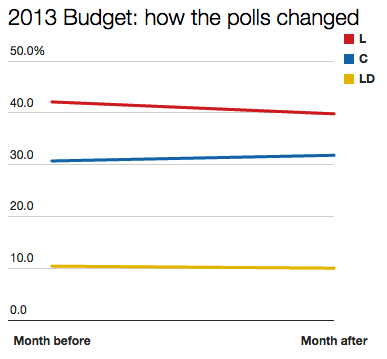 Definitely it takes time for Budgets to sink in in terms of polling.